YOUR WELLNESS SPA Mind-Body Health 60 DAYSPA | AUGUST 2014 of war. Or with a refugee who speaks no English but a song from his child- hood helps slow the elevated heart rate symptomatic of post-traumatic stress disorder." In Stevens' book, she correlates ele- ments of music to their healing proper- ties. "Rhythm," she says, "relates to the body. It's the beat, as primitive as the heartbeat we heard in the womb that was our fi rst music. Melody is the song; it's what's in our hearts. Harmony touch- es our soul—it's about relationships. And silence, the 'rest' in music, relates to our own rest and breath and space." THE MUSIC INSIDE Ludwig van Beethoven said, "Music is the mediator between the spiritual and the sensual life." We know that music can change our mood, hasten our heal- ing and just plain make our day, but only recently has science begun to understand the "how" in its powerful effect. Dr. Charles Limb, associate professor at the Johns Hopkins School of Medicine and faculty member at the Peabody Conservatory of Music, has conducted extensive studies on music's relationship to the brain. He says, "Music can stimulate activity in virtually every part of the brain, such as areas for sensory processing of sound and vision, motor control, emo- tional processing and language, in addition to the prefrontal regions linked to consciousness, creativity and working memory." Making music seems to especially activate some of these processes. Stevens says, "Research that looks at the brain changes in musicians fi nds how much they are utilizing both their left and right brains. They be- come whole-brain thinkers." Music therapy is often used in rehabilitation of brain injury, such as stroke, or brain function disor- ders, such as Alzheimer's disease. "Ongoing studies are working to identify the specific neural substrates that are active during music therapy, and under- stand how music may allow the brains of those with mental or physical impairments to overcome or com- pensate for their limitations," says Limb. Stevens sees music's power on the brain in the most literal terms. "An Alzheimer's patient will sing four verses of 'Amazing Grace' yet can't remember his daugh- ter's name," she says. There has also been much research (and debate) about music's effect on the developing brain. Whether listening to Mozart in the womb will turn your kid into a Rhodes scholar remains to be seen. However, this 2012 study at McMaster University in Ontario con- cluded the following: After completing the fi rst study of its kind, research- ers have discovered that very early musical training benefi ts children even before they can walk or talk. They found that one-year-old babies who participate in interactive music classes with their parents smile more, communicate better and show earlier and more sophis- ticated brain responses to music. THE BEAT OF YOUR OWN DRUM Science is still uncovering more and more information about how and why music affects us so profoundly. Much depends on the individual. "Music therapists assess the client's needs and musical preference and incorporate this into the selection or design of their intervention," says Barbara Else, MPA, LCAT, MT-BC, senior advisor and consultant for the AMTA. "We pay close attention to the elements of music in decid- ing on different music and sound exposures. So, say you are a big fan of New Orleans-style jazz: the mu- sic therapist understands the elements and traditions such as structure, form, rhythm and instrumentation behind that music and draws from it." The future of music used therapeutically appears to be endless. 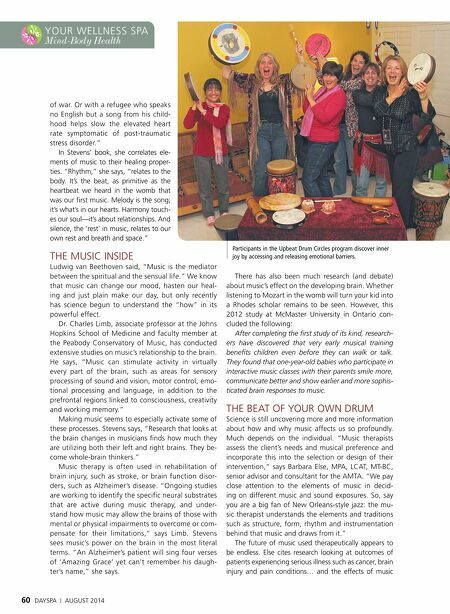 Else cites research looking at outcomes of patients experiencing serious illness such as cancer, brain injury and pain conditions… and the effects of music Participants in the Upbeat Drum Circles program discover inner joy by accessing and releasing emotional barriers.